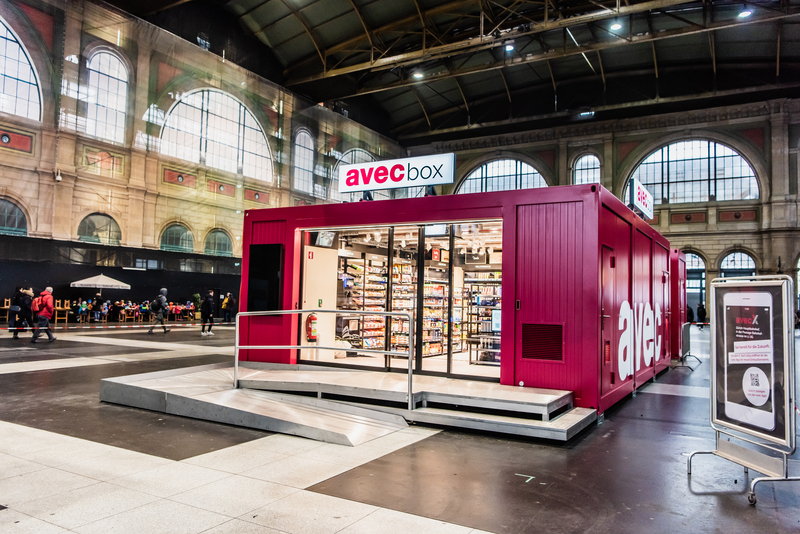 At 10.00 a.m. on 6 April 2019, Valora's first cashier-free convenience stores will open their doors with avec box and the avec X future store at Zurich main station. Access, purchase and payment are controlled by the avec app. In the new stores, convenience refers not only to the product range, but the entire shopping experience which can be done even more comfortably, at your own pace and outside of normal opening hours. On 6 April 2019, Valora will open its first store based on the new avec box concept at Zurich main station. The most advanced convenience store in Switzerland offers a tried-and-tested range of convenience products, including fresh food to eat on the go, everyday food items and the most important household products. The avec box will be installed at Zurich main station from 6 to 22 April 2019. It will be open from Monday to Thursday from 04:30 to 00:30 and all the time from Friday 04:30 through Monday 00:30. The staff will be there during rush hour in the morning and evening to support customers with their shopping, stack the shelves and keep the premises in order. The avec box at the Wetzikon station is still planned for spring 2019 as announced, after which the concept should be rolled out to other regions in Switzerland. The new concept has been developed to expand the existing formats. With avec box, Valora is meeting growing customer demand for more autonomy and flexibility in shopping. The current focus falls on gaining experience with avec box before the concept is rolled out. The avec X future store will also open its doors at Zurich main station on 6 April 2019. This store will be Valora's innovation laboratory for the shopping experience of the future. Customers will be continuously introduced to the latest food convenience trends here. Digital shopping experiences will also be tested, such as new payment options and personalised shopping. This will start with new modules that were developed to allow customers to put together their individual tea, salad and granola recipes. Based on past product purchases, customers will receive an individual product recommendation at coffee machines and tobacco dispensers. There are currently no plans to roll out avec X in other regions. Valora will further develop the tested ideas on the basis of customer feedback and will ideally integrate them into its other sales formats such as avec and k kiosk. avec X has the same opening hours as avec box. Shoppers need the avec app for both stores as they do not have any cash registers. Persons from the age of 14 can register in the app, which is available for iOS and Android. Once registration has been successful, customers can enter the store by scanning a QR code. They can then scan in their products at their own pace – or tap them later via NFC (Near Field Communication) as for avec X – and add them to their personal shopping cart. Payment is finally made via the avec app – without any need for queuing. Data privacy is very important to Valora in relation to avec box and avec X. All personal data are only processed in accordance with data protection requirements. More information about avec box and avec X and detailed explanations about registration, use and data privacy can be found at box.avec.ch and x.avec.ch.